World Wide Wingsuit News: Pulling G's! Pressurized just released a new tracking suit called the TwentyG. 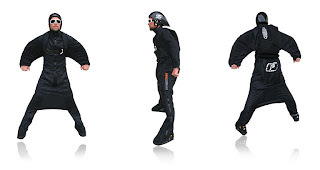 The TwentyG Suit is based on the design of VKB in Norway. This suit is caracterized by enormous forward speed, easy handling and an easy pull. The penguin-shaped wings create very little drag due to a rubber-cord which is incorporated into the jacket, running from one sleeve to the other. There is no air-inlet for the jacket. The clean and thin wing airfoil just comes from the tension of the cord.